It's based on an ancient toy. As a child, you might have played with a toy made out of a cardboard disc and rubber bands. When you pull the rubber bands tightly, the circle will spin — and it turns out the same concept can be used to save lives from malaria. In a new paper published today in Nature, researchers from Stanford University described their simple, but ingenious, design for a homemade centrifuge, a medical and scientific device that doctors use to separate blood into cells and plasma and help diagnose diseases. Usually, centrifuges are bulky, expensive, and powered by electricity, but the newly-developed Paperfuge can do the same thing at a low cost — only 20 cents. This paper centrifuge is lightweight, but it’s quite powerful. It can spin 125,000 r.p.m., separating plasma from whole blood in less than a minute and a half using only human power. Not only that, doctors can use it in places where medical facilities and electricity are lacking. 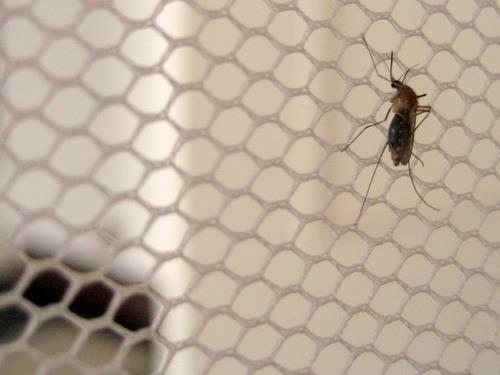 It only takes 15 minutes for the Paperfuge to isolate malaria parasites. “This was an interactive effort between math and physics and experiments - which led to the final parameters that allow us to spin this simple tool all the way to 120,000 r.p.m.,” Stanford University professor Manu Prakash, who worked on creating the Paperfuge, tells Inverse. The Paperfuge can help doctors diagnose malaria, especially in areas most affected by tropical diseases. In 2015, over 400,000 people died from malaria, and climate change isn’t helping. As global temperatures rise, climate change will cause 250,000 more people to die from malaria, malnutrition, diarrhea, and heat stress each year between 2030 and 2050. And by 2030, climate change will force 100 million people into poverty. The Paperfuge is also versatile and can be made of other materials, like plastic. Previously, some researchers suggested using egg beaters and salad spinners as centrifuge devices, but since they’re bulky and don’t spin as fast, they’re impractical for separating blood and plasma. The research team started exploring simple toys to model the centrifuge off of. They first looked at the physics of yo-yos, but yo-yos are not as fast. Then, one of the post-docs in the lab decided to image whirligigs, and the team spent the next six months understanding the physics and math of this toy. Making paper technology isn’t new for Prakash. He has a philosophy of “frugal science,” with the goal of building and designing tools for science — and sharing them broadly. He has previously made the origami-inspired Foldscope, a cardboard microscope that costs less than a dollar. Doctors can easily fold it up and use it in developing areas. “My broad philosophy is to democratize the experience and ability to do science; not just read about it,” Prakash says. And making healthcare technology affordable increases accessibility for more patients — just ask these kids, who made Martin Shkreli’s $750 malaria drug for only $2. Prakash and his postdoc M. Saad Bhamla just returned from Madagascar. They will run a field clinical trial with the Paperfuge and share the results soon. “We are engaged not just in technical testing, but exploring how to bring these tools to communities that need them at large scale,” Prakash says.